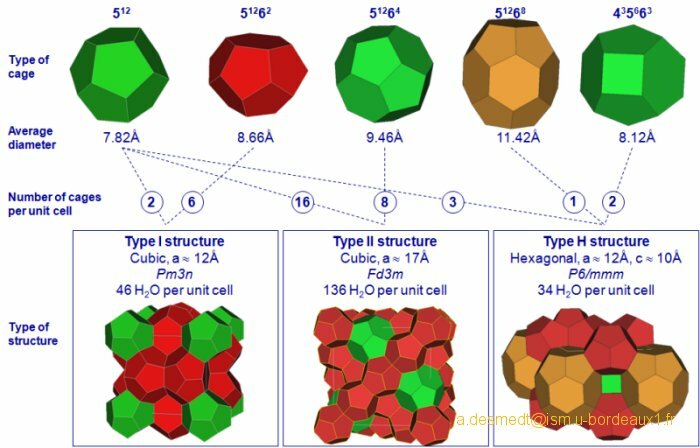 Clathrate hydrates are nanoporous crystalline materials made of a network of hydrogen-bonded water molecules (forming host cages) that is stabilized by the presence of foreign (generally hydrophobic) guest molecules. The natural existence of large quantities of hydrocarbon hydrates in deep oceans and permafrost is certainly at the origin of numerous applications in the broad areas of energy and environmen- tal sciences and technologies (e.g. gas storage). At a fundamental level, their nanostructuration confers on these materials speciﬁc properties (e.g. their “glass-like” thermal conductivity) for which the host-guest interactions play a key role [ref. 37]. These interactions occur on broad timescale and thus require the use of multi-technique approach (Neutron scattering, Raman, NMR, Molecular Dynamics Simulations) in which neutron scattering brings unvaluable information [ref. 39]. The investigation of dynamical properties of clathrate hydrates, ranging from intramolecular vibrations to Brownian relaxations reveals the underlying factors governing chemical-physics properties speciﬁc to these nanoporous systems. By inserting H2 molecules with the help of a promoter (tetrahydrofuran, noted THF), systems relevant for hydrogen storage application are formed by using relatively soft pressure (of the order of 100 bar) near room temperature. Dynamic properties of hydrogen molecules confined in the small cages of the deuterated THF clathrate hydrate have been investigated at equilibrium by means of incoherent quasi-elastic neutron scattering (QENS). These QENS investigations provide direct experimental evidence about the fundamental aspect of translational diffusive motions of the hydrogen molecules. A comprehensive study of the hydrogen molecules dynamics above 100 K has been achieved through a quantitative analysis of the structure factors (i.e., the spatial extend of the H2 diffusive motion) as well as of the QENS broadening (i.e., the characteristic time of the diffusive motion). On the probed time scale, the H2 molecular translations occur within localized spherical area in the cage with low activation energy of 1.59 ± 0.06 kJ mol–1. The dynamical diameter of H2 molecules varies from 2.08 Å at 250 K to 1.64 Å at 100 K, and the diffusion constant ranges from 0.16 ± 0.03 rad ps–1 at 100 K to 0.49 ± 0.03 rad ps–1 at 250 K. These results indicate that no diffusion between the cages is observed in the picosecond time scale [ref. 40]. Representation of the protonic conduction in an acidic hydrate.